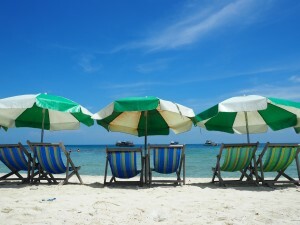 Koh Samui is recgonised as one of Thailand’s best islands. 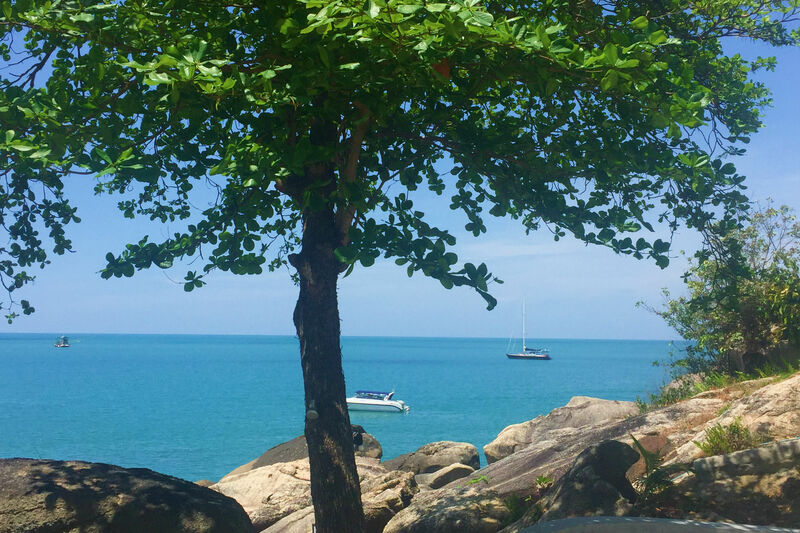 Even though you could literally spent weeks exploring the wonderful things Samui has to offer, there are even more hidden treasures to discover. I had a great opportunity to join Captain Roman Guerra of Le Cochon Noir V , The Black Pig V (aka Piggy) for an island-hopping cruise. 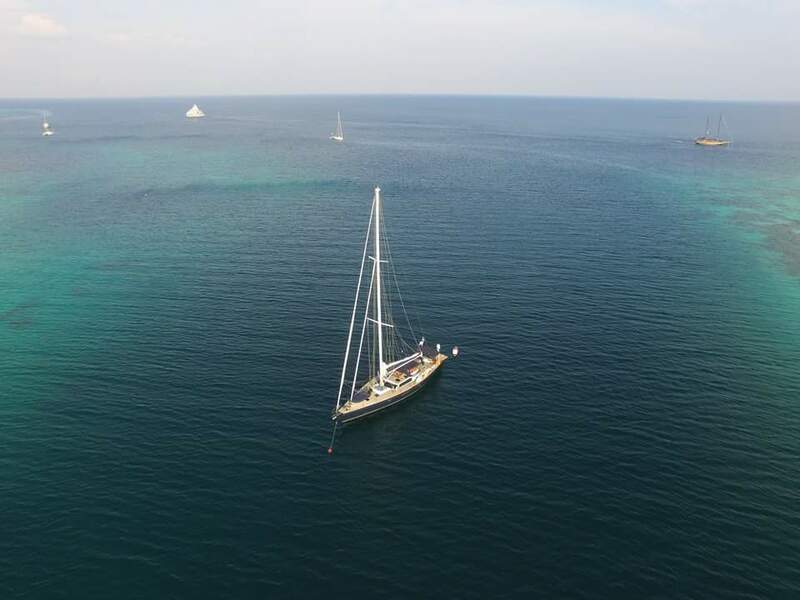 A blue Monohull cruising family at 76 foot long, this boat houses four bedrooms, four bathrooms, and has plenty of extra space to relax. 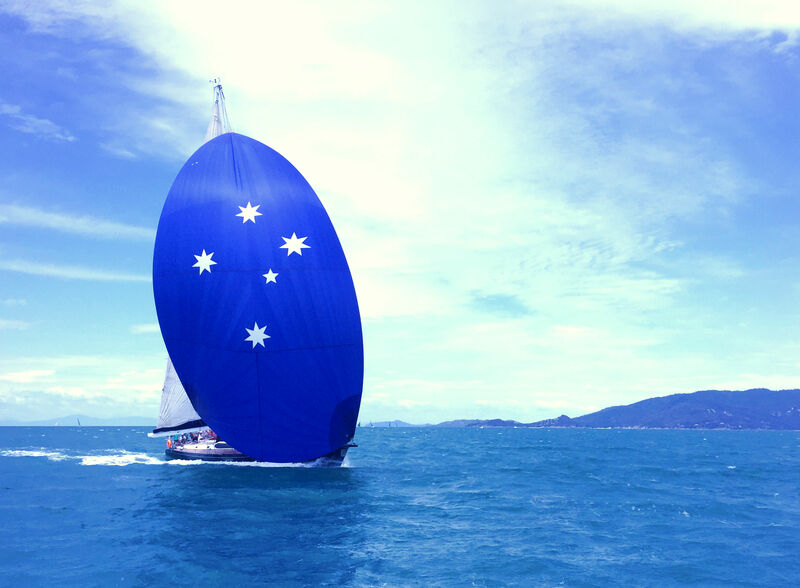 With more than 20 years of experience cruising around the world (from the Caribbean to the China Sea and the Pacific and Indian Oceans), we knew we were in safe hands. 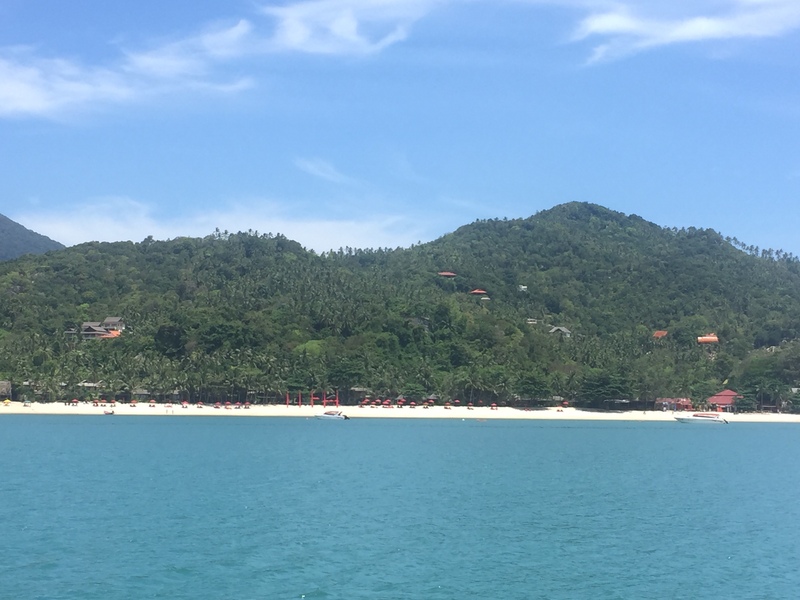 Our five day, five night trip started with a ride on a ferry speed boat: we were headed to Koh Pha-ngan to meet Piggy by Seatran Discovery. The ferry traveled from Bangrak Pier (Koh Samui) to Thong Sala Pier (Koh Pha-ngan). We then took a motorbike taxi to Mae Haad Beach, where Piggy was anchored. 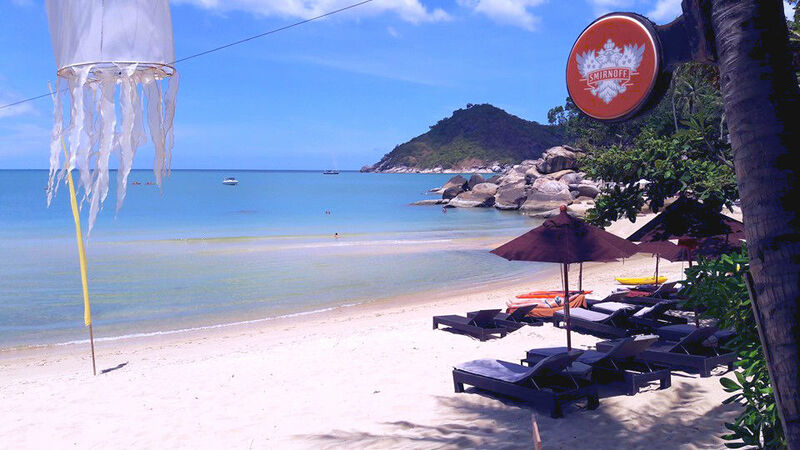 Koh Ma is located next to Mae Haad Bay, which you can walk directly through from Mae Haad Beach on Koh Pha-ngan. A wonderful spot for snorkeling and best spot for peacefully watching the sunset with your love ones, Koh Ma is worth the visit. We spent the morning snorkeling; the best spot is accessible by dinghy/paddle board. 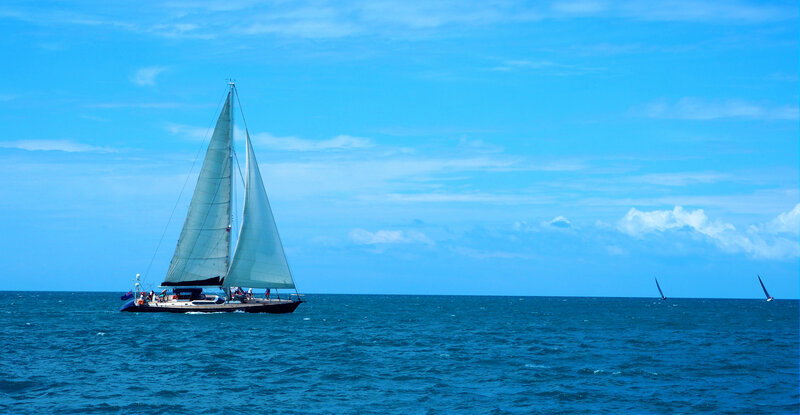 You’ll find a wide variety of fish, beautiful live coral reef, marine life, small caves around the island and limestone. We spent the afternoon on the beach of Mae Haad Bay, where you can enjoy local dishes, sipping cocktails or freshly coconut juice while watching the beautiful, golden sunset. 1. Use the fin while snorkeling, it is helping you to swim faster and not too tired while snorkeling. 2. Be a marine life friendly, do not try to touch any fish, take the coral back home or the worst could be step in to the hard coral which can be harmful to grow the coral. 3. Too much sunscreen lotion is also harm to the coral and marine life. To prevent the sunburnt from your snorkeling or exploring, I totally recommend to wear the long sleeve swimsuit to prevent at least 80% of sunburn and you can be the one who save the world. 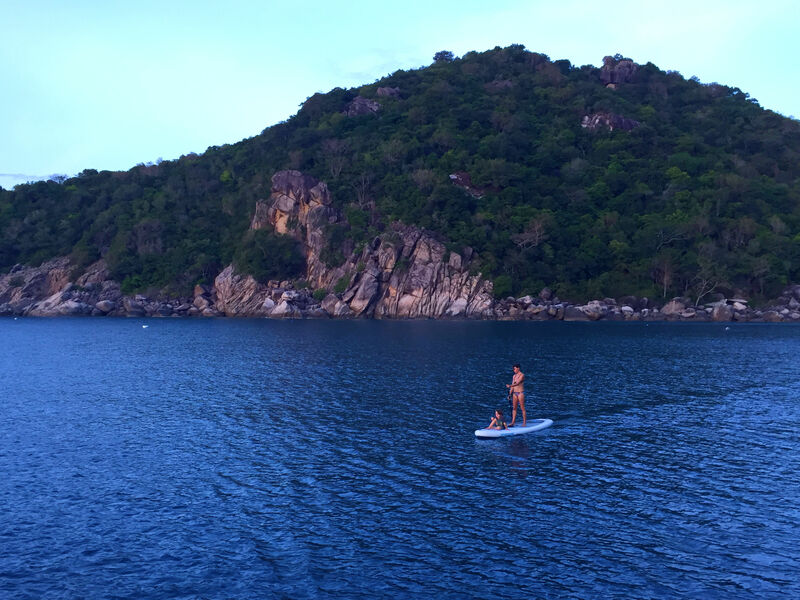 After living the slow life at Mae Haad Bay for two nights, we sailed to onward to Koh Tao. We anchored at Mango Bay, where Piggy would be protected from strong winds and currents. Mango Bay is the quietest area, and houses another nice spot for snorkeling and rock climbing (although I do not personally recommended it). We spent most of the next day at Koh Nang-Yuan, a 10-minute boat ride from Koh Tao. It consists of two small islands connected via sandbank. 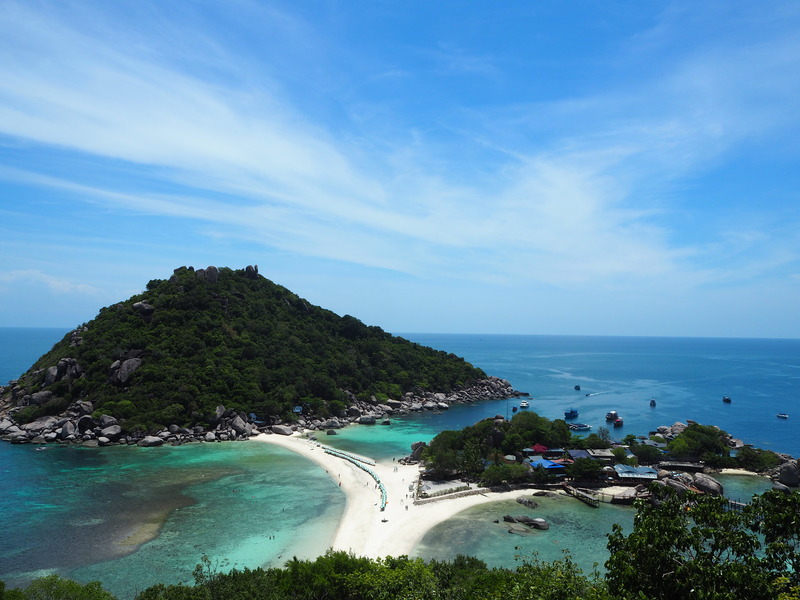 Koh Nang-Yuan is most popular for snorkeling, but our favourite spot is the amazing view point from the top. 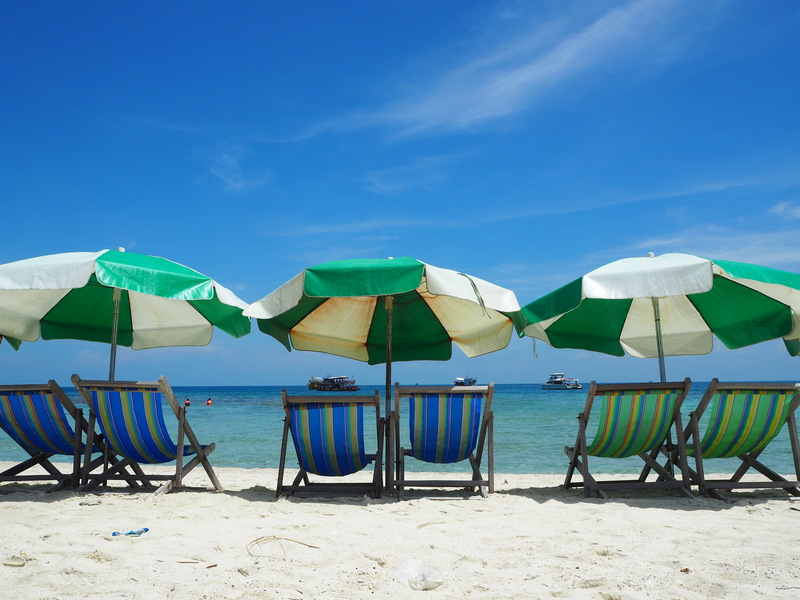 Tip: Be an eco-friendly traveler! The island does not allow visitors to bring plastic bottles, so make sure you don’t accidentally bring any along. It’s the best way to help our world go green: use less plastic, say no to foam, do not litter and properly throw out all trash. We sailed back to Koh Pha-ngan to spend the last night on Thong Nai Pan Noi Bay. It’s another calm bay that’s perfect for those who are looking get away from the hustle and bustle of the full moon parties around Haad Rin. Dining in a local restaurant, we then watched the fire-show while sipping cocktails and counting shooting stars from Piggy (There was always more than one shooting star each night). The next morning, we chilled by the beach before heading back to Koh Samui in the afternoon, anchoring in Bangrak, nearby Amari Koh Samui. It was finally time for me to say goodbye the friendliest, most incredible Captain Roman Guerra and his family, Isis and Rah, who looked after us the whole trip. We enjoyed everything, especially the delicious food. We’ll definitely be back for more adventures.